This story begins with Camp Fire Girl Mints and ends with a puff of smoke from a tightly rolled joint. But first a word from my mother. The only movie she ever barred me from seeing was Butterfield 8. Like that was even necessary. Pollyanna with Haley Mills was released the same year, for chrissakes, and I was really young although I might have liked Psycho, also released that year, me loving suspense. Anyway, to defy my mom, my next-up sister T- dragged me to a theater on Ventura Blvd. to watch Elizabeth Taylor slink around in a black slip and drink whiskey with Laurence Harvey. Much later I fell in love with Taylor and Harvey but in the movie theater, I was bored. Bo-red. Time passed, I became a high school senior. T-, five years old than I am, became a hippie. Our mother worked as a bookkeeper for her Christian Science church. Pop did what pops do – plied his trade and stopped off at bars. One afternoon, T-, who no longer lived at home, walked in through the back door with a key of dope. Weed. Marijuana. Like hay, a key, or kilo, of weed is comprised of leaves, sticks, and seeds. Hay, tightly packed and bucked into the barn as a bale is identifiable in black-and-white and Technicolor. Hay sings, hay dances, hay strums. In Oklahoma, Curly courts Laurey, the ladies curtsey a ballet, curtains blow in a window flung open to a musical agrarian fantasy with no small amount of hay. So T-, who was living in Topanga, needed money for an “illegal abortion.” I remember her saying that exact phrase. She knew of a doctor in Orange County and announced I was helping. I would love to describe myself as being pro-choice, as I am now, but really, I grappled with what to feel, said nothing, and just set up the card table. Wielding a long kitchen knife, T- began to break up the key. The thrust of the blade on the bale was fierce and satisfying – she let me at it, too. My sister measured one-ounce parcels of dope, dope is what we called it, into baggies and instructed me sell to my classmates. She had her hopes. Let me back up. Remember Camp Fire Girl mints, those glistening dark chocolate sticks lined up like Madeline’s schoolmates in a rectangular box, beckoning with their sharp mintyocity and dark chocolateness? As a young Camp Fire Girl, say ten or eleven, I could not sell more than five boxes. I can’t explain why except that I was in that near-paralytic state which has chased me throughout this life and probably will into the next. My mom had to buy out my inventory. Seriously. If there was a Camp Fire Girl bead in salespersonship I did not earn it. Wo-he-lo, nonetheless. Wo-he-lo means peace. That’s Camp Fire Girl speak. Flipping in time, again, to 1967 and the mandate that I sell, I was flummoxed. Eager as my sweet mother was, or maybe resigned, to shield me from life’s lessons, I did not think she would now buy up baggies of marijuana – what? – and share with the ladies in her church – no cigs, no booze, no caffeine (except for the buzz from chocolate mints). Christian Scientists were not our target market. Although I was not friendless at school, I was not in any in-group and certainly was not the cool outsider girl who can deal pot under the bleachers. Somehow or other I sold three baggies – three ounces. One was bought by another outsider girl and two by male classmates whose appearance at my house had my parents so excited for me, they ordered pizza. One of the dope-buying classmates is now nationally respected in his field so I’ll leave it at that. To return to my point, in Southern California in 1967 I moved three judiciously packed baggies of good dope. The Doors, Procol Harum, Sly & the Family Stone, Cream, Wilson Pickett, Jimi Hendrix, Chambers Brothers, Jefferson Airplane, Buffalo Springfield – all celebratory of the grooviness – were part of the musical score that year, and I could move only three baggies. (For the record, Aretha Franklin was queen that year.) My sister unloaded the rest and was able to do what she needed to do. When I left for college she gave me a baggie and as a precautionary warned me not to let anyone know I had it. In the middle of my first semester, I opened my dorm room door. Everyone was smoking. Let the fun begin. I am convinced I would be a better and happier person today if I had sold more dope, or more Camp Fire Girl mints. If I had the personality that enabled me to sell. I would be more convincing, more outgoing, self-assured, able to close deals for raises or new jobs. Win over people, make new friends, be rich, be happy, be American. But I am not that person. But I’m here to tell my tale. And T-, who warned against the dangers of weed once she stopped smoking and dropping, is still here, too. Sarah Sarai’s short stories are in Gravel, Devil’s Lake, Storyglossia, Homestead Review, Fairy Tale Review, Weber Studies, Tampa Review, South Dakota Review, and other journals; her story, “The Young Orator,” was published as a chapbook and e-book by Winged City Chaps, Her poetry collection, The Future Is Happy, was published by BlazeVOX; her poems are in journals including Ascent, Boston Review, Pool Poetry, Thrush, Yew, and Threepenny Review. Links to her book reviews, poems, and stories are on her blog, My 3,000 Loving Arms. Sarah is a contributing editor for The Writing Disorder and a fiction reader at Ping Pong Literary Journal published by the Henry Miller Library. 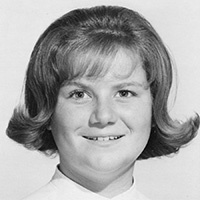 She attended grammar school and junior and senior high in the San Fernando Valley. She now lives in New York.